His Holiness the Fourteenth Dalai Lama Tenzin Gyatso (Tib. ཏ་ལཻ་བླ་མ་བསྟན་འཛིན་རྒྱ་མཚོ་, Wyl. ta lai bla ma bstan ‘dzin rgya mtsho) (b. 6 July 1935) is Tibet's spiritual leader and the seniormost figure in the Tibetan Buddhist tradition. His Holiness was born in Amdo, in the north-east of Tibet in 1935. He left Tibet in 1959 following the Chinese invasion which began some years earlier. Since then, His Holiness has resided in Dharamsala, India, the site of the Tibetan government-in-exile. He was awarded the Nobel Peace Prize in 1989. 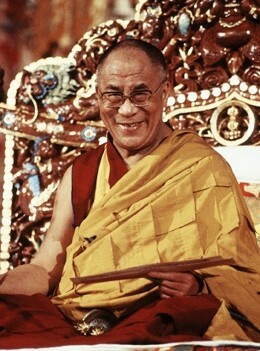 The Dalai Lama is, I believe, nothing less than the face of the Buddha of Compassion turned toward an endangered humanity, the incarnation of Avalokiteshvara not only for Tibet and not only for Buddhists, but for the whole world—in need, as never before, of healing compassion and of his example to total dedication to peace. The Dalai Lama has become familiar worldwide as one of the great leaders of our time, and someone who devotes his entire life to the welfare of humanity. With his message of kindness, compassion and universal responsibility, he has touched millions of people, of any or no religion, and lit in their hearts a flame of hope, inspiration and courage. His uplifting vision of a more caring, fairer and saner world, his stand on non-violence, and his promotion of human values have transformed the lives of people all over the world. As we face today’s many global challenges, His Holiness’s influence and voice become steadily more important, his leadership more vital. Thinking deeply of our common future, His Holiness has brought the wisdom and contemplative methods of Buddhism into close contact with the sciences, medicine, psychology and other disciplines. This extraordinary initiative is already having a profound impact, and will produce far-reaching effects on society and education, and for future generations on earth. As a spiritual leader, the Dalai Lama has attracted worldwide admiration and respect among members of all faith communities, and has helped to give Tibetan Buddhism its rightful place among the world’s major religions. It is thanks to him that its science of the mind and compassionate practices have begun to take root so very widely in the contemporary world. A great Buddhist master, His Holiness has also ensured and strengthened the authentic living lineages of Tibet—which themselves maintain the pure Nalanda tradition—so they can thrive long into the future. At the same time, he has encouraged a spirit of religious harmony and non-sectarianism, and inspired an open, modern outlook and an awareness of science and current issues among Tibetan Buddhist leaders and Tibetan society. As a Tibetan, I feel an infinite sense of appreciation and gratitude for the way in which His Holiness has helped us maintain our Tibetan identity, culture and spiritual heritage, and, like a father to us all, taken care of the Tibetans in every way imaginable. He has been our guiding light and our refuge during the most difficult period of our history. With all my heart, and with sincere devotion, I wish that His Holiness live for many, many more years in the very best of health, and so see all his aspirations come alive and bear fruit, one by one, and without any interruption. For he embodies not only the highest hopes of the Tibetan people, but the deepest wishes of so many men and women throughout the world. ↑ According to Western calendar. According to the Tibetan lunar calendar, he was born on the 5th day of the 5th lunar month. This page was last edited on 17 September 2017, at 16:30.